Since I knew I’d be baking a pumpkin chiffon pie, I thought I could try something new and different for the second Thanksgiving pie. A recipe for apple cider cream pie sounded intriguing, but there were a few alterations we thought we’d try. Several of the reviews had issues with the pie crust, so I thought I’d stick with my old standby crust and roll it in graham cracker crumbs (which I read helped maintain pie crust integrity with cream pies). We also thought we’d slice a few cinnamon-sugar apples and place them on top, to make things extra apple-y. Before rolling out the pie dough, sprinkle work surface with flour and ¼ cup graham cracker crumbs. Roll out dough and sprinkle the remaining crumbs on top. Place into 9″ glass pie plate, trim overhang and crimp edges decoratively. Chill until firm, about 15 minutes. Preheat oven to 425 F. Line crust with parchment paper and fill with pie weights or dried beans. Bake until crust is barely set, about 15 minutes. Remove parchment and pie weights and continue baking until crust is set but not browned (cover crust edges if browning too quickly). Lower oven temperature to 350 F.
In a medium saucepan, boil the cider until it is reduced to ½ cup. Transfer to a bowl and let cool. Whisk in ¾ cup sugar, sour cream, and salt, then whisk in eggs. Pour the custard into the shell and bake pie for 25 minutes or until the custard is just set. While the pie is baking, heat sugar, butter and ½ tsp cinnamon in a dish in the microwave. 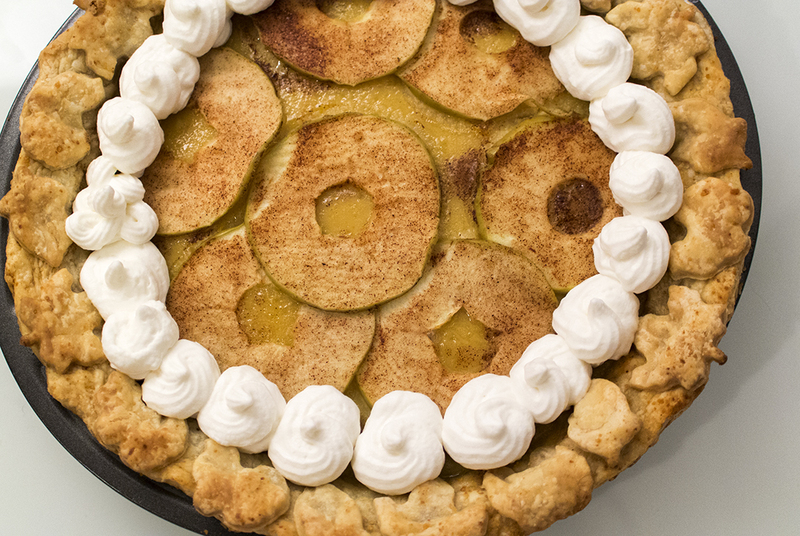 Remove pie from the oven and place apple slices atop the custard. Brush with the cinnamon-sugar mixture and put pie back in the oven. Continue to bake for an additional 10-15 minutes. Let the pie cool completely. In a medium bowl, using an electric mixer, beat heavy cream with with remaining ¼ cup sugar and cinnamon until firmly whipped. Mound the cream on the pie or serve on the side. I took it to be a success when guests took seconds of the pie–it had a wonderfully full apple cider flavour. The crust held up nicely and didnt get soggy from the cream filling. We had left it at room temperature while making other things for the meal, and D noted that it tasted even better chilled (when we had it the following morning). We also could have probably put the apple slices on earlier so they’d be a touch softer. Otherwise, it made for a lovely, tasty new addition to our stable of pies!